The Pirate Unit Study They Will Beg to Do! Pirates are fascinating, that is a fact. And there is no better way to get in some history than studying all about pirates. We went through a long pirate phase that resurfaces every once and a while. My son really loved pirates and it was hard to find enough materials to satisfy him. He wanted to know Ev er y thing! A homeschool unit study is great for this very reason. Don’t let the word unit study throw you off if you are not a homeschooler. Unit study resources are for everyone and they are a lot of fun to use. I think games are a fun way for boys to learn. Try Arrr! It Be Pirate Games for a variety of pirate games online and offline. Play games pirates may have played, play pirate-y puzzle and physics games, try a few word searches or crosswords, or play a pirate math game. There are a lot of pirate books out there but not all of them are good. Let me tell you, we went through a whole big, huge stack to find the very best ones. We ended up with a Treasure Chest of Pirate Books for Boys. Enjoy! We didn’t want to leave out the younger pirate lovers so we put together a annotated list of Pirate Books for Young Buccaneers as well. There are a couple of ABC books and the list includes our very favorite pirate picture book. Sail Ho! It’s a Pirate Ships Unit Study is all about ships and the pirates who sailed them. Learn about famous pirate ships, watch a documentary, find out about the jobs on board a pirate ship, find out about ship parts and see diagrams. Try the sailing simulator,and a few fun activities as well. Shiver Me Timbers, Pirate Weapons! Great info on pirate weapons including diagrams, videos, games, books, toys and DIY pirate weapons too! Learn all about Pirate Flags with this fun unit study which includes information on famous pirate flags, symbolism, links to pictures of flags, the Jolly Roger, as well as pirate flag activities for boys. Make a compass, try some fizzing treasure chests, go on a treasure hunt to practice mapping and literacy plus more hands-on activities. 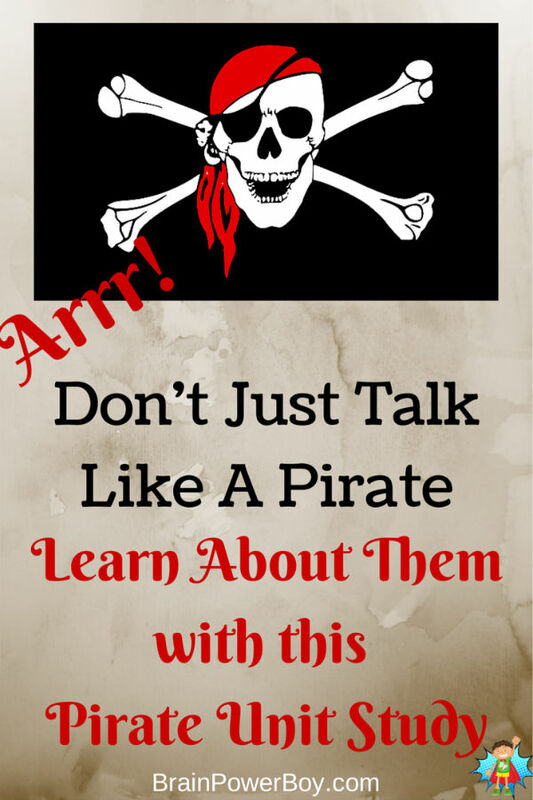 See my guest post on 3Boys and a Dog Homeschool Unit Study Pirates! for Preschool Boys. Play these fun Pirate Sight Word Games if you have a young buccaneer who is learning to read. Pirate Facts Lunch Box Notes are great to slip into a lunch box or to set beside a homeschool lunch. Make this Pirate Perler Bead Trio. It is a fun and easy project idea. A bit of pirate humor for you: Funny Pirate Books to Make Boys Laugh. These books are great! Have you subscribed to our newsletter yet? I would love for you to join us. Thank you for stopping by! 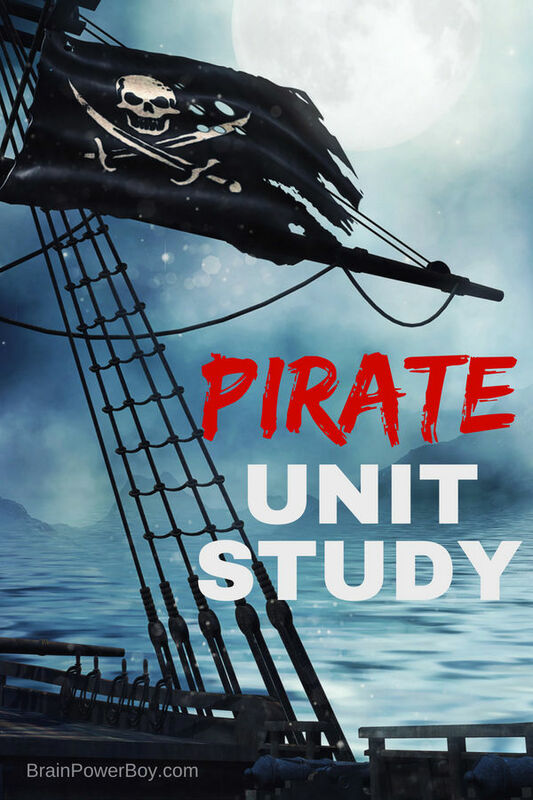 I hope you enjoy this pirate unit study as much as we did! I can’t wait until the kiddos are old enough to learn about pirates – it’s such a great topic that can expand their knowledge in so many ways. You just enjoy those little ones Clare. Plenty of times for Pirates down the road. Thanks for the comment. Glad to find your nice linkup. Great ideas! We love pirates around here (all girls), too! Thanks for joining the #laughlearnlinkup! I am a pirate lovin’ gal myself 🙂 Happy to link up–thanks for stopping by. Hey Sheila! This looks like a great unit! Thanks for sharing at Family Fun Friday! Thanks Selena. Nice of you to stop by. This is great! We just started listening to Treasure Island, so many of these will fall right in line with that. Thanks so much for sharing at the Little Bird Told Me link up. Thanks Erin, I hope your kids find a few activities to enjoy alongside the book.